Refurbished Fargo HID DTC1000 Single-Sided ID Card Printer. Works with Windows XP, 7, 8 & 10 (Windows 8 driver works in Windows 10), and MacOS X. The DTC1000 card printer/encoder can be built to your specific needs. ID Card Printer has been tested working onsite! ID Card Printer has wear from previous use including scuffs and scratches. ID Card Printer comes as shown, and only includes pieces shown in photos. See images for more details. ID Card Printer is on hand and ready to ship. Please feel free to message us any question you may have. Thank you for checking out our listing. . 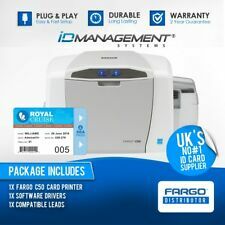 The Fargo 51700 features inline card printing with one connection using a standard USB connection. The Fargo C50 single-sided card printer is simple to use with an intuitive design that reflects system updates through color-changing buttons. 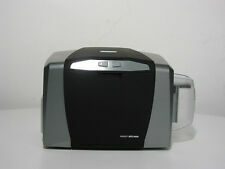 FARGO DTC4250e Single Side ID Card Printer (P/N 052000). Starter Single Side ID Card Printer Kit Starter Photo ID Card Printer Systems Kit. Printer Driver : Windows® XP / Vista™ / Server 2003 & 2008 / Windows® 7 / Windows® 8 (32 bit & 64 bit) / MAC OS X 10.5/10.6/10.7/10.8/10.9/ Linux (Available Soon). The FargoHDP5000 Single Sided Printeris a high-end printer capable of printing thousands of cards with extra reliability. FargoHDP5000 Color Card Printer. -USB & Ethernet port connections. Our ID experts are ready to tackle any photo ID or plastic card printing challenge! Enhanced security : In addition to sophisticated encoding options, the DTC4000 will print a UV layer for an increased level of physical security on the card. The DTC4000 can also be password protected at the printer so only approved operators can print and encode plastic security cards and badges. Another major benefit of the HDP5000 is that it will print all the way to the edge of the card without leaving a white boarder. In comparison, a standard Thermal Printer has a lower print quality and will leave a small 1mm white boarder around printed cards. 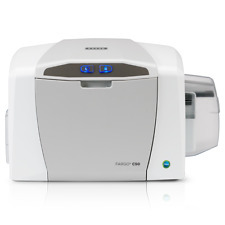 Fargo C50 Single-Sided Color ID Card Printer. Badge Holders. A PC is required to make changes within the Workbench Printer Utility in the printer driver. Printer Ribbons. -Printer Driver and User's Manual CD. HID Global's Fargo HDP5000 dual-sided lamination module is ready to be connected to any version HID Global Fargo HDP5000 Printer, single or dual-sided, and there's no need to upgrade your driver or firmware, because with plug-and-play recognition by the main board your printer can be field upgradeable in seconds. 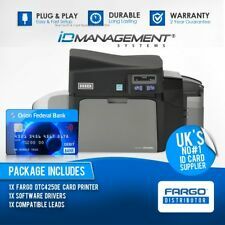 FARGO DTC4250e Dual Side ID Card Printer w/Magnetic Stripe Encoder (P/N 052110). Complete Dual Side ID Card Printer w/ Magnetic Stripe Encoder Kit Magnetic Stripe Encoder. 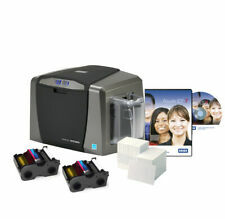 Complete Photo ID Card Printer Systems Kit. HID Global's Fargo HDP5000 single-sided lamination module is ready to be connected to any version HID Global Fargo HDP5000 Printer single or dual-sided, and there's no need to upgrade your driver or firmware, because with plug-and-play recognition by the main board your printer can be field upgradeable in seconds. 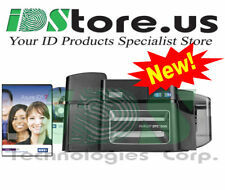 I have an ID printer that can print duel sided ID cards, laminate them, comes with software and supplies. Thanks for looking Shipping cost will depend on your location and added to final cost. It is boxed and ready to ship, I can take it to a shipping station of your choice. FARGO DTC1250e Dual Side ID Card Printer w/ Magnetic Stripe Encoder (P/N 050110). Complete Dual Side ID Card Printer w/ Magnetic Stripe Encoder Kit Magnetic Stripe Encoder. Complete Photo ID Card Printer Systems Kit. The FARGO® HDP5000 features operation that requires only minimal training. Sharper image quality and new HDP materials produces more impressive cards at a lower cost per card. The HDP5000 prints on film instead of directly on the card, ensuring that the uneven surface of technology cards doesn’t compromise image quality. The Fargo C50 printer seamlessly combines convenience and efficiency to produce a sleek, compact model that can fit into even the smallest of work spaces, to get you from box to print within a matter of minutes. The C50. convinces with its affordable price and its elegant and simple design. Marke HID Fargo. Card printers, plastic card printer. Thermosublimations card printer. Print speed: 24 seconds per card / 150 cards per hour (YMCKO).